Combine first 11 ingredients in a large bowl; toss until combined. Cover and marinate in refrigerator for 30 minutes. Cut a large circle out of the parchment paper or a large rectangle. Remove shrimp mixture from bowl; reserve marinade. 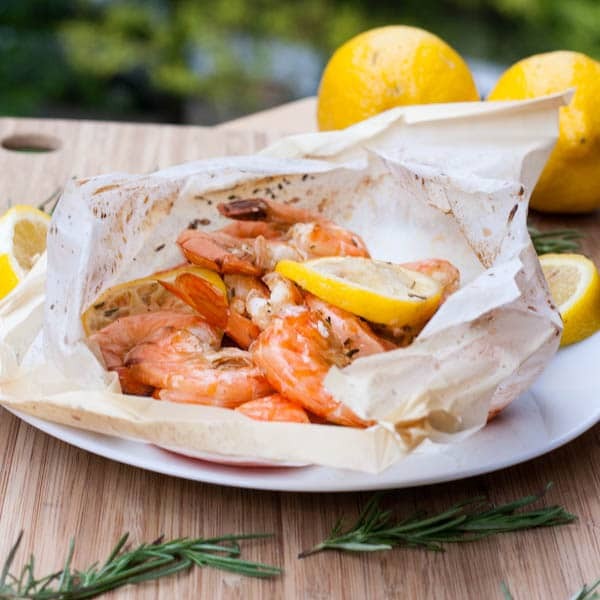 Place one quarter of the shrimp mixture on each parchment sheet. Drizzle remaining marinade over shrimp. Top each with 1 teaspoon butter. Fold over the circular parchment paper and fold over the edges multiple times to seal or if using a rectangular piece fold over the sides. Place packets on a baking sheet. Bake for 20 minutes. Let stand 10 minutes. Carefully cut the packets open and serve immediately.